Clean and cut crabs into pieces and keep it aside. Grind grated coconut, chillipowder, coriander powder, turmeric powder, ginger, shallots and tamarind to a smooth paste adding little water. In a pan, add cleaned crabs, ground paste, 1/2 cup water, green chillies, tomato and salt and cook on medium flame. 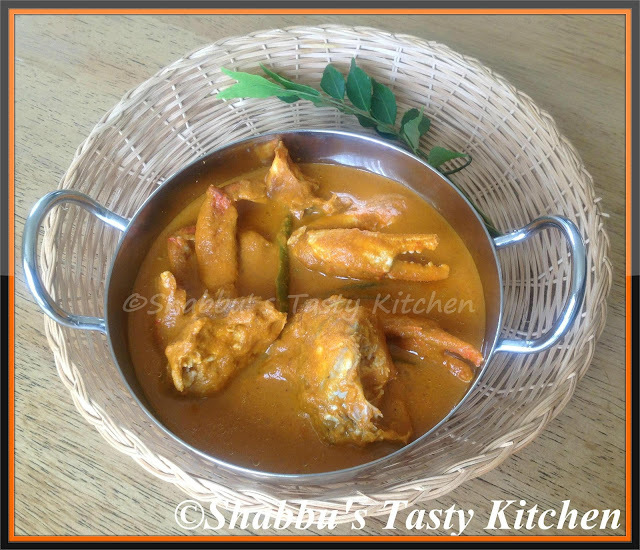 Slurp,mouthwatering here..Fingerlicking crab curry definitely. Flavorful gravy.. Yummy and very inviting!! tempting and mouthwatering curry dear....I am your new follower.